The lack of basic infrastructure worsened the situation as it made the teaching and learning environment uncomfortable for children. There was no fencing around the school’s compound, which exposed students to the threats of busy traffic leading to one of the largest towns in the province and signaled the poor amenities within the school itself, such as a lack of toilets and handwashing stations, as well as dilapidated courtyards. These factors led school staff to believe that the learning and teaching experience at the school was demoralizing and uninspiring, with many students dropping out of school to work on farms instead. 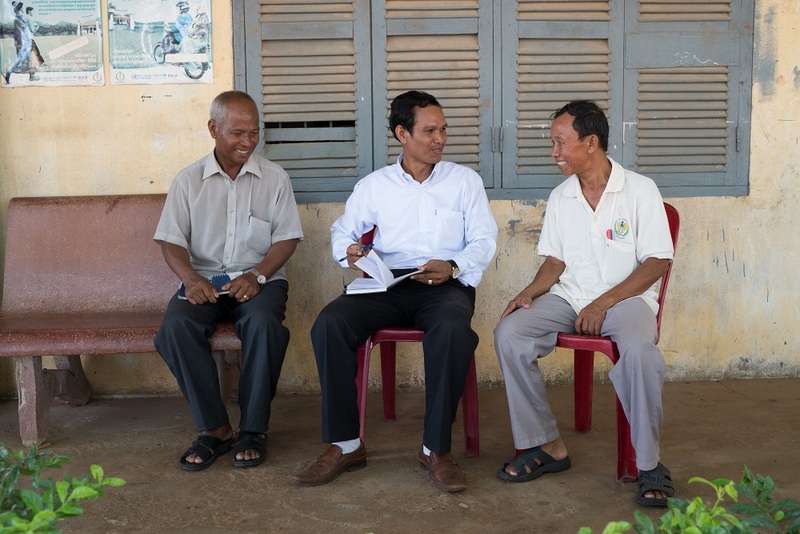 When Mr. Khun Nim assumed the position of Director of Svay Kal Primary School in 2010, he was faced with these tough challenges that prevented his students from receiving good quality education. However, in just eight years, he has successfully turned the fate of the school around. Today, children from nearby Svay Kal village enjoy coming to school and appear more enthusiastic to learn from teachers who are more driven to conduct engaging lessons for their students. Mr. Nim’s strategy was simple. He knew that if he wanted to improve the quality of education for his students, he needed to make the school friendlier and more welcoming to children. However, he realized that he could not achieve this on his own – he decided to enroll the support of the school support committee. Encouraging local communities to be more involved in the education system is one of the key initiatives of the Capacity Development Partnership Fund (CDPF) – a multi-donor fund led by the Ministry of Education, Youth and Sport (MoEYS) with support from the European Union, the Swedish International Development Agency, the U.S. Agency for International Development, the Global Partnership for Education, and UNICEF to strengthen Cambodia’s education system. Through CDPF professional development workshops, Mr. Nim was trained on how to properly develop a school management and operational plan, including the importance of involving local community members in the school’s activities. “After going to these CDPF workshops, I wanted to involve as many people as possible in discussing any issues the school faced and to give their input when we draft the School Operational Plan, so I reached out to parents and the village chiefs to become more active in the school support committee,” Mr Nim said. School support committees are becoming increasingly important in running schools effectively. Members of the committee consist of village elders and community leaders who volunteer as liaisons between the school and members of the community. They often have multiple roles, although the committee is most essential in sourcing additional funding needed to ensure the school has the facilities and resources necessary to enhance students’ learning experience. 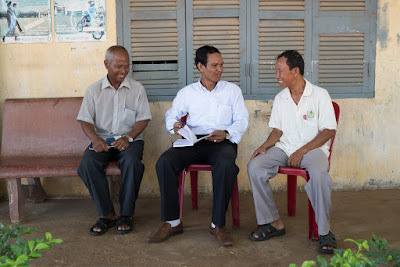 Mr. Yong Hieng, the village chief, has been involved with Svay Kal’s school support committee since 2006. However, the committee was mainly dormant because members were not consulted or involved in school operations. “We were not close to the school because no one asked us to join the meetings, which meant that we couldn’t give our opinions on how to improve the school for the students,” he said. sitting at the garden he helped fundraise for and build. Today, Mr. Hieng is the head of Svay Kal’s school support committee and he continues to lead fundraising efforts on the school’s behalf by seeking donations from local community members. The committee can raise up to $20 per ceremony; funds are then used to upgrade the school’s facilities. The handwashing facilities and new garden are recent upgrades in the school, provided thanks to the committee’s fundraising efforts. Rubbish bins have also been provided to reduce littering in the school and much needed tanks of clean drinking water are now regularly delivered to each classroom. In addition, with training and support from Mr. Nim, the school support committee carries out household mapping activities aimed at improving school enrolment and attendance. As part of the exercise, school staff and committee members canvass nearby villages to speak to and support families with the challenges they face in enrolling their children in school. As a result of the close collaboration between the school leadership and the community-led school support committee, Svay Kal Primary School has seen remarkable improvements in its education data such as increased enrollment rates and higher transition rates of students into lower secondary schools. In fact, the dramatic changes that have occurred under Mr. Nim’s leadership have not gone unrecognized. In 2017, he was awarded the provincial golden medal for school leadership based on these achievements. He also adorns a corner of his office with various framed certificates of excellence he has received over the years as a reminder of his accomplishments. “I am very happy with the school support committee. Without them, we would not have been able to do anything,” he says. 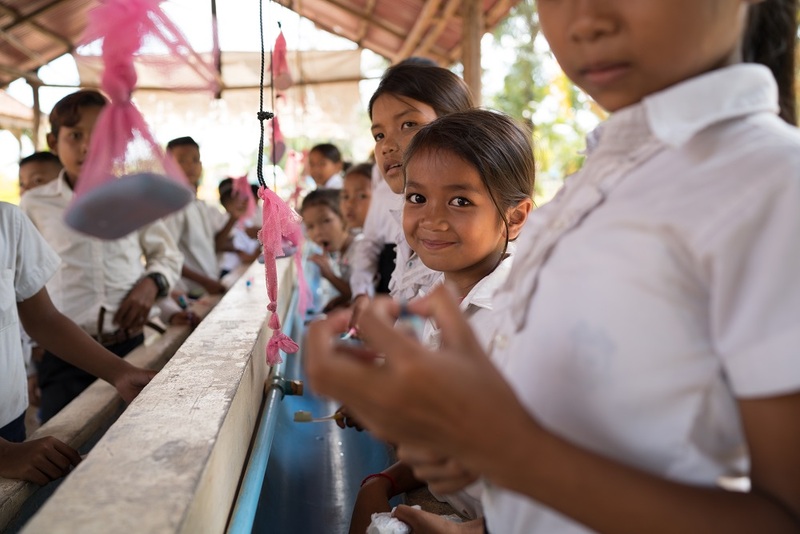 Students at the WASH facility at Svay Kal Primary School. raised by the school support committee. Mr. Hieng is also happy with the work that his committee has done. 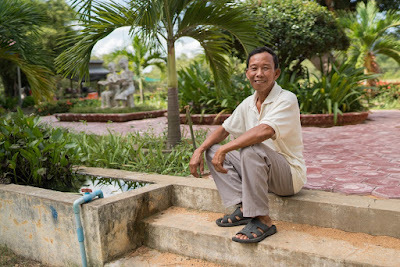 He beams with pride as he observes that Svay Kal’s students seem to enjoy coming to school more now that the school compound is cleaner and the facilities are more comfortable. However, both Mr. Nim and Mr. Hieng know that they have more to do. Their immediate priorities now are to reduce the school’s dropout rates and increase the average test scores of its students. Together, the men remain committed to addressing and overcoming challenges at the school. “I have seen how important it is to engage everyone, including the local community, in the planning process. I will continue to inform people of the importance of becoming involved so that we can further improve in the future,” says Mr. Nim.